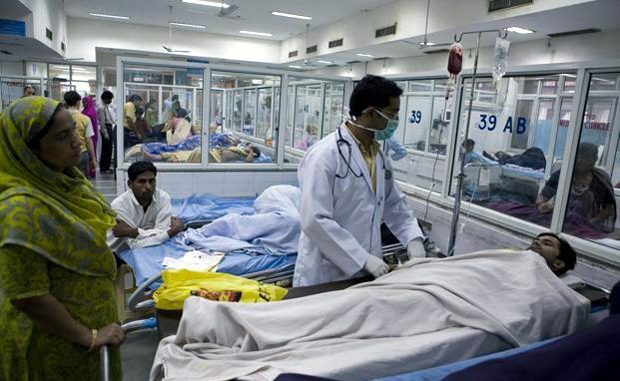 New Delhi : The quality of healthcare in India is way behind its neighbours, including Bangladesh, Bhutan, Sri Lanka and China, shows a recent study. Out of 195 countries analysed for the study, India is ranked 154th. The Global Burden of Disease study published in the medical journal The Lancet says in the past 25 years, India’s healthcare access and quality (HAQ) index has seen an increase of 14.1, going up from 30.7 in 1990 to 44.8 in 2015 on a scale of 100. However, it is not good enough as the numbers are far behind than its neighbouring countries such as Sri Lanka (72.8), Bangladesh (51.7), Bhutan (52.7) and Nepal (50.8). Among its neighbours, India’s health index remains better than only Pakistan and Afghanistan, whose index is 43.1 and 32.5 respectively. India has specifically fared poorly in neonatal disorders (14), chronic kidney diseases (20), tuberculosis (26), rheumatic heart diseases (25), hypertensive heart disease (33), diabetes (38), and congenital heart diseases (45). The study is a comprehensive worldwide observational epidemiological study that describes mortality and morbidity from major diseases, injuries and risk factors to health at global, national and regional levels. The study examines healthcare trends from 195 countries and territories from 1990 to 2015. Making comparisons across populations enables understanding of the changing health challenges facing people across the world in the 21st century, say researchers who performed the study. The findings suggest, between 1990 and 2015, nearly all countries and territories saw their HAQ Index values improve, but the difference between the highest and lowest observed HAQ Index was larger in 2015 than in 1990, ranging from 28•6 to 94•6. Of 195 geographies, 167 had statistically significant increases in HAQ Index levels since 1990, with South Korea, Turkey, Peru, China, and the Maldives recording among the largest gains by 2015. While the global HAQ Index average rose from 40•7 in 1990 to 53•7 in 2015, researchers feel far less progress occurred in narrowing the gap between observed HAQ Index values and maximum levels achieved. “If every country and territory had achieved the highest observed HAQ Index by their corresponding level of SDI, the global average would have been 73•8 in 2015,” the report says. The study was funded by the Bill & Melinda Gates Foundation.